LaserZone Huddersfield: What is LaserZone? LaserZone Yorkshire - Our arenas in Bradford and Huddersfield are the largest in the UK and we are Yorkshire's most exciting family entertainment experience with something for everyone. No messy paintball games, just good clean lasertag action in specially designed and themed arenas. Unlike other centres, our arenas have a unique theme. Huddersfield is themed around a futuristic abandoned town, complete with a chemical plant, police station, auto shop, church, castle, warehouse and power station. Bradford is themed around an underground bio-chemical warfare research station, with various sections including a train depot, shooting range, kennels, cold storage, biolab, cells and the Red Queen. LaserZone is an activity for everyone, regardless of age or gender (as long as you meet our minimum height requirement and are wearing flat shoes - no heels allowed, sorry! ), so whether it's your birthday or your office is having a party, or you're just looking for something different to do with your time, contact us and have a blast. 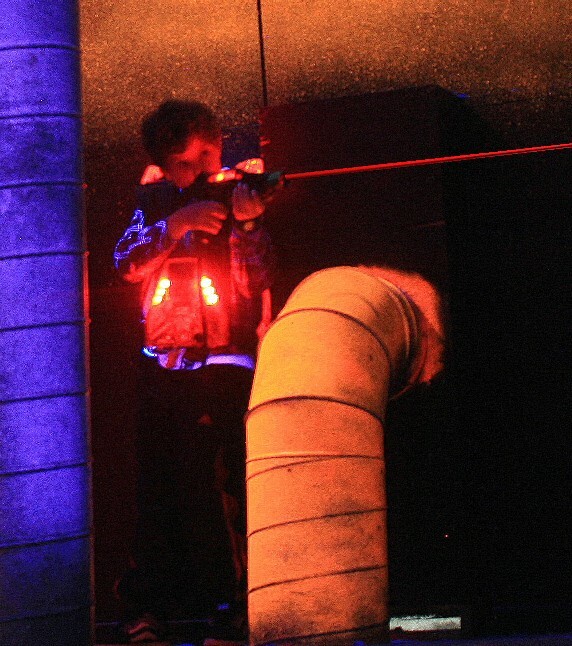 LaserZone is the ultimate laser tag game. Using state-of-the-art, computer controlled equipment, you score points by shooting your opponents. You can terminate other players for a short time and you can even earn extra points by deactivating the bases inside the arena (but be careful, they can shoot back!). The game is played in our professionally themed, 8,000 square foot laser arena filled with special effect lighting, great music and theatre grade smoke all creating an exciting atmosphere, adding to the overall game experience. You will be greeted by one of our well-trained members of staff who will quite happily answer any queries you may have. While waiting for your game to begin, you are welcome to wait in our specially designed reception area, or use the cybercafé facilities (charges apply). When it is time for your game to begin, you will be led to our briefing room, where the marshal will instruct you on the rules of the game and proper use of the equipment. This is to ensure your full enjoyment and safety during the game, so if you are unsure of anything, this is the time to ask questions. You are now ready to enter the arena, an urban battlefield full of hidden corners and strange buildings. On entering you have 20 seconds to hide. Once this time has elapsed your pack lets you know by saying "Prepare to activate". You are now armed and ready - it is time to hunt your opponents. The arena has plenty of places to hide, but there is never anywhere that is completely safe. Even the most secure areas have hidden mines and sentinels. A voice will make you aware of the end of the game and ask you to proceed to the exit. There, the marshal will be waiting to help anyone struggling to remove their packs, and will remind them of their pack names. These are important as once you re-enter our reception, you will be given a score sheet showing you your game stats and how well you did in the game.